Guided night tour of glittering Las Vegas in an open-air pink Jeep Wrangler. Highly trained tour guide entertains with stories, urban legends, and history. Photo-op at the iconic “Welcome to Fabulous Las Vegas” sign. See the lovely Wedding Chapel Row and famous Gold and Silver Pawn Shop. Visit historic Fremont Street Experience with its high-tech light and sound show. Conveniently returned to the starting location of your food tour by Pink Jeep Tours at the end of the night. Get ready for a culinary adventure that gives way to an evening of razzle-dazzle in this five-hour excursion. Journey on a global exploration of tantalizing flavors at four world-class restaurants -- without ever leaving the Strip. At each destination, you’ll be whisked immediately to VIP seats to enjoy up to four signature dishes. Along the way, you’ll sight-see and be privy to insider stories about one of the country’s most fascinating cities. 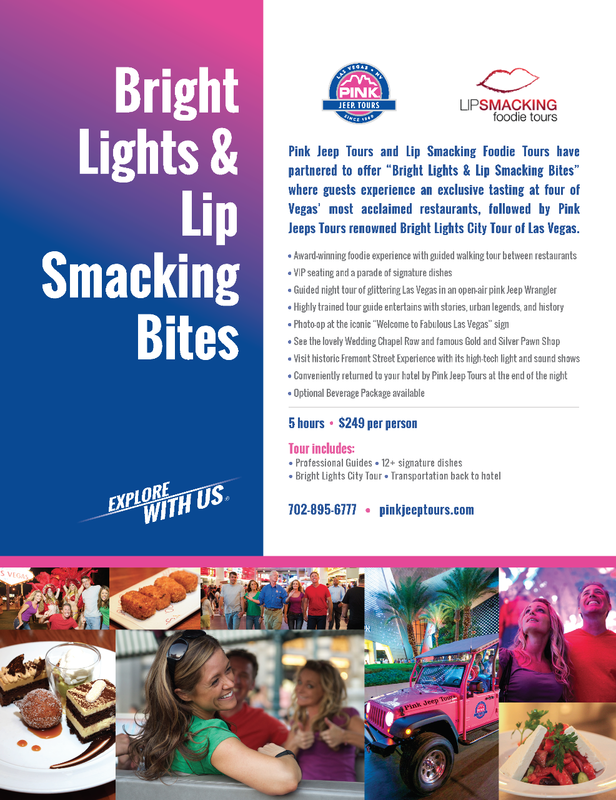 After the dining experience, you’ll climb aboard an open-air, Pink Jeep Wrangler, for an unforgettable ride past all the glittering lights of the Strip. A guide will entertain with stories and history about this fascinating city, including how the famous casinos got built. Along the way, you will have the opportunity to snap photos next to the iconic “Welcome to Fabulous Las Vegas’’ sign, as well as see Wedding Chapel Row, and historic Fremont Street with its high-tech light and sound displays. At the end of the tour, Pink Jeep Tours will deliver you conveniently back to the starting location of your food tour.